PT Bank Pembangunan Daerah Banten Tbk - Bank Banten (IDX : BEKS) is a rapid growing banking company in Indonesia. 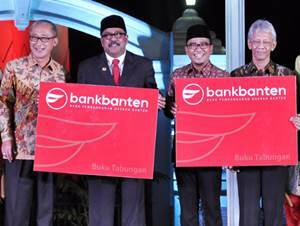 Bank Banten was incorporated on 9 August 1993 under the name of PT Executive International Bank. In 2010, the company changed its name to PT Bank Pundi Indonesia Tbk. The name of PT Bank Pembangunan Daerah Banten Tbk officially launched on 29 July 2016. According to Bank Banten's profile as cited by JobsCDC.com, Bank Banten is 35.41% owned by PT Banten Global Development, 24.08% by PT Recapital Securities, 11.80% by PT MNC Kapital Indonesia Tbk, and 28.71% by publics. Bank Banten is based in Jakarta and its head office is registered at Jl RS Fatmawati No 12 Jakarta Selatan. At present, Bank Banten runs its business through 71 office networks spread across Indonesia. Minimum age of 27 years and maximum 35 years old. Minimum 3 years of experience in public accounting firm or 4 years in the accounting field at bank. Have a good understanding about the accounting practices of banks and taxation. Operating knowledge of Excel and banking accounting applications. Have a good knowledge of Indonesian Banking Accounting Guidelines, Indonesian Banking Regulation, LBU reporting to Bank Indonesia, PSAK, taxation. Able to work under pressure and deadline. Minimum age of 24 years and maximum 30 years old. Expertise with web based programming language. Expertise with PHP, .NET, database MySQL and MS.SQL. JobsCDC.com now available on android device. Download now on Google Play here. Please be aware of recruitment fraud. The entire stage of this selection process is free of charge. PT Bank Pembangunan Daerah Banten Tbk - Staff, Division Head Bank Banten October 2016 will never ask for fees or upfront payments for any purposes during the recruitment process such as transportation and accommodation.